Volunteers were on hand to pray with people who relocated to Central Florida after the 2017 hurricane season. 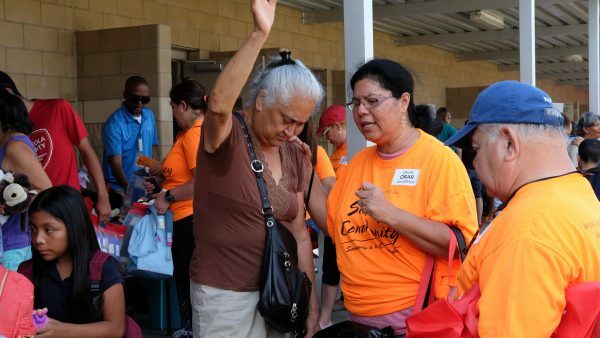 On Saturday April 21 Florida Baptists ministered to hundreds of people from Central Florida communities and led several to Christ during “Serving the Community” event at Gateway High School. “This all started because we saw a need,” said Emanuel Roque, Hispanic church catalyst for the Florida Baptist Convention. “More than 300,000 people recently arrived in Florida, fleeing hurricane damage in Puerto Rico, and need help getting settled in this new environment,” he added. 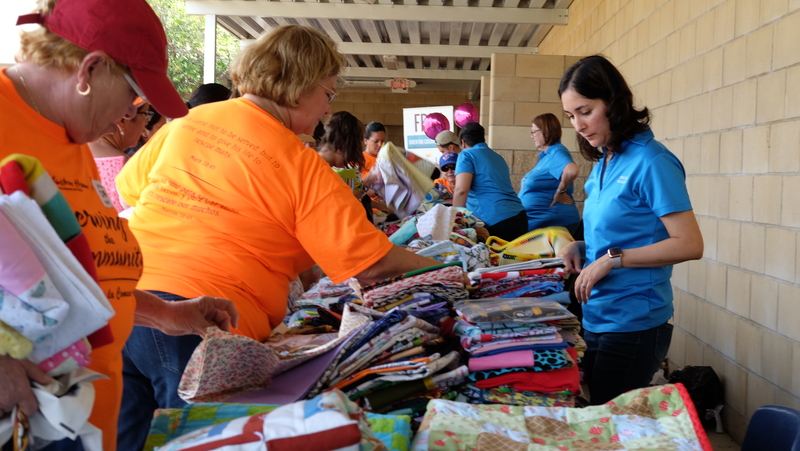 Osceola County School District employees passed out blankets. On that sunny Saturday 500 people from nearby communities like St. Cloud, Orlando, Winter Garden and Kissimmee came through the school where they had the opportunity to take home free resources from different exhibitors like Walgreens, Goodwill, LifeWay en Español, and the Osceola County School District among others. In a shaded corner of the school courtyard designated as the prayer area, volunteers prayed with visitors throughout the day and led many to Christ. A total of 32 professions of faith were made during the event. Florida Baptist Disaster Relief provided hot meals for lunch. Strength Team’s Zeb Bishop shared Christ with the crowd with illustrative feats of strength. Edwin Serrano, former member of Puerto Rican music band Grupo Mania, sang Christian merengue songs and shared how he was saved. Many prizes were given away through raffles and from the stage. On Thursday and Friday 18 local churches and 11 South Florida partner churches canvased communities leaving invitations to Saturday’s event by hanging flyers on doorknobs and passing out invitations at supermarkets. 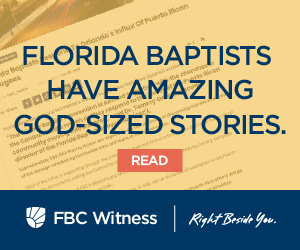 Alberto Ocaña, pastor of Iglesia Bautista Northside in Hialeah, said that most of the people that he spoke to at the event were already connected to a local church, something he found encouraging. Victor Rivera, pastor of Horizon West Community Church in Winter Garden, brought 20 volunteers to the event—including South Florida church partners—and is planning on having another block party type event at his church next week to continue outreach into the community. Nathan Blackwell, St. Cloud mayor and pastor of Cornerstone Family Church, was at the event and expressed his happiness at seeing churches coming together to welcome the new arrivals and help them get settled. “Accommodating such rapid growth is our biggest challenge,” he said and added that Puerto Ricans make up the largest demographic of the new arrivals. Blackwell said that more than 3,000 children have been added to the school system suddenly and there isn’t enough housing for the families. Florida Baptist Disaster Relief mobilized to serve Central Florida communities. During the second half of the day the 300 volunteers loaded vans, trailers, buses and trucks with food brought by Disaster Relief and delivered them to families housed at hotels along Highway 192. 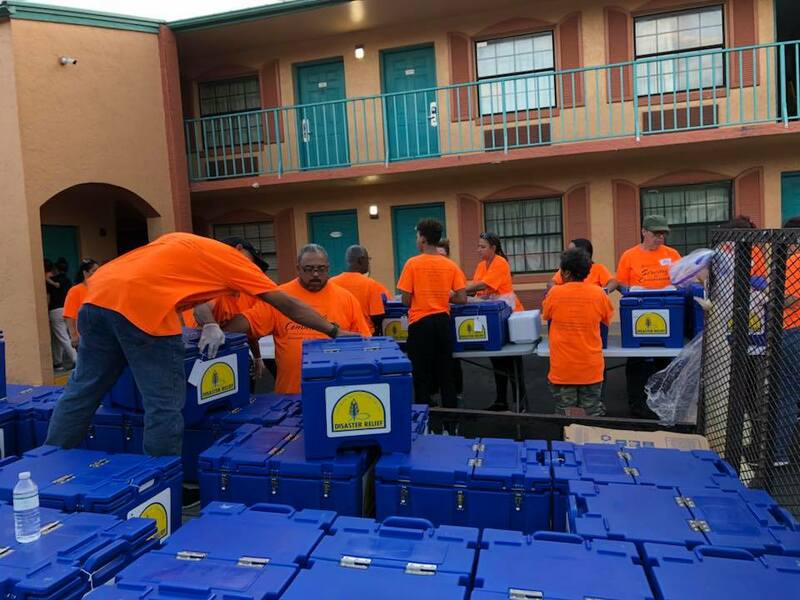 “1,000+ meals given out in hotels along Highway 192 by Iglesia Bautista Central with each one receiving the gospel presentation in word or literature,” wrote Roque in a FaceBook post. “It was a privilege and a blessing serving my community with my family this weekend,” said Darita Fernandez, a volunteer and member of Iglesia Bautista Central. Over the coming weeks the churches will continue to go out into their communities and will continue to host events like this one to serve the new arrivals, to help them get settled but most importantly, share Christ with them, said Roque.